Showcase your fabrics with 18" blocks featuring an offcenter 12" square. No inset seams and borderless for an up tempo look. 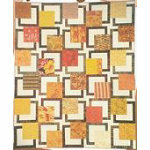 Build the BQ in sets of 6 blocks, choosing the number of fabrics that are perfect for your project. Fabric tips and a 9" BQ block also.